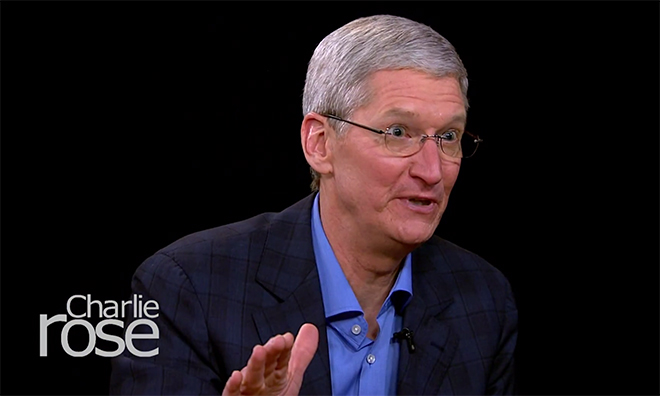 In an upcoming PBS interview with Charlie Rose, set to air Friday night, Apple CEO Tim Cook discusses the company's current product lineup, Beats, Apple TV, Steve Jobs' legacy and hints at new product categories that "no one knows about." When asked about Apple's future product pipeline, Cook admitted that there are a lot of things the company has interest in, but a focus on execution prohibits the number of devices it can work on at any given point. "There are products we're working on that no one knows about, yes. That haven't been rumored about yet," Cook said. On the iPhone 6 and 6 Plus, Cook trumpeted praise for the latest handsets, gushing about the Retina HD displays, thinness and speed. Cook pooh-poohed a question asking whether Apple was playing catch-up with Samsung in releasing new 4.7-inch and 5.5-inch models. "No, we —honestly, Charlie, we could have done a larger iPhone years ago. It's never been about just making a larger phone," Cook said, adding, "It's been making —it's been about making a better phone in every single way." The Apple chief also talks about Apple TV, reiterating that television is an area of "great interest" for the company. As usual, not much was shared in the way of details, though Cook did reveal a few things he would like to change regarding user experience. As for Beats, Cook said the acquisition was more than just about talent, referring to music mogul Jimmy Iovine and rap star Dr. Dre. He touts the firm's Beats Music, saying the streaming service's human-curated playlists give a different "feel" compared to competing services. Finally, Cook talks about Apple cofounder Steve Jobs, saying, "I think about Steve every day," a comment he made on Tuesday during an interview with ABC News' David Muir. Another interesting tidbit dropped during Rose's interview is that Jobs' office remains untouched at Apple's Cupertino headquarters. Portions of the two-part interview will air on Charlie Rose This Week tonight, to be followed by the full first segment a few hours later. The second part is scheduled to go live on Monday.